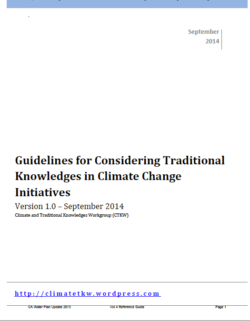 This publication is meant to be an informational resource for tribes, agencies, and organizations across the United States with an interest in understanding Traditional Knowledges (TKs) in the context of climate change. It is meant to inspire dialogue and questions, and to foster opportunities for indigenous peoples and non-indigenous partners to braid TKs and western science in culturally-appropriate and tribally-led initiatives. 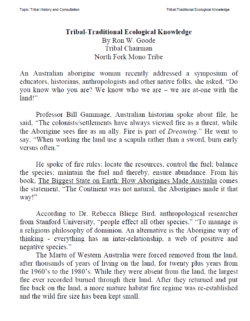 The publication establishes firmly that in all possible cases it is tribes who should ultimately decide answers to specific questions about whether English-language words such as “traditional knowledges” are the best words to use, what knowledges should count as significant to their cultures and communities, and what the terms of sharing or declining to share should be. The information presented in these Guidelines is believed to be current as of the time of production. The Guidelines are a work in progress. The workgroup anticipates revising it over time.